Following on from the first part in this mini series discussion which looked at theatre on the big screen in live screenings of shows, this piece will look at theatre on demand. Should theatre be consumed on smartphones, laptops and tablets whenever we want it? Taking theatre to the big screen was the first step in bringing theatre to digital audiences but this still resulted in collective audiences who enjoyed theatre together. But taking theatre to Netflix for example where it can be consumed from your bed, your living room, in your pyjamas and the ability to pause, rewind and fast-forward? Is that what theatre is about? BroadwayHD is a Netflix-like streaming platform, launched by Stewart F. Lane and Bonnie Comley in 2013, specifically aimed at theatre lovers. For just $8.99 per month, audiences have access to theatre content, featuring a library of over 100 plays and musicals. It is essentially a platform that brings real-time Broadway shows directly to people’s connected devices all over the world. Creator Lane says Broadway is ripe for streaming revolution due to a confluence of technical innovation, shifting media habits among theatre fans and rapid cultural changes. But what are the positives and negatives of this for audiences and industries? In the digital age, audiences want more and more entertainment brought to them and this does not exclude the theatre. Netflix announced earlier this year that it would explore filming theatre productions, starting with producing a specially created version of the Broadway play American Son available on demand. In a poll conducted by The Stage, 86.42% of people welcomed Netflix’s move into theatre productions, against only 13.58% of people who disagreed. The positives of live streaming from an audience perspective are very similar to that of bringing theatre to the big screen in collective live screenings. Being able to watch from your own home increases the accessibility for theatre fans with physical ailments, it is more comfortable, no queues for the toilets, no expensive ice-creams and so on. The fact that you needn’t trek to New York or London to catch world-class theatre makes it geographically accessible also. An additional access point could also extend to mental health access. Many sufferers of autism, especially children, are afraid of/uncomfortable around loud noises and social situations. Those who have, similarly, may find social situations of going to the theatre stressful, especially when there is a bible of unwritten rules on theatre etiquette that you should abide by to avoid glares from fellow audience members or ushers. Being able to watch theatre from your own home and comfortable space eliminates these issues and widens theatre for those who may struggle with the conventional theatre setting. The idea of putting Broadway online is also attracting to younger audiences. The average Broadway theatregoer is pushing 44 years-old, so theatres embracing new and modern modes of consumption can only be a good thing for younger audiences. The idea of younger audiences also ties in with financial accessibility. The price of seeing a show on Broadway is on average $113, and the younger generation is unlikely to have this money. In contrast, BroadwayHD is a mere $8.99 per month for access to a library of over 100 shows. By bringing theatre to everyone easily and cheaply, it is opening a door to those who may not have considered theatre before, and in a variety of ways (audiences and ticket buyers, actors, stage crew, producers etc.) we need the younger generation to be engaged in the theatre to allow it to thrive. Lowering the price of Broadway does also come with its risks, however. It was noted that 77% of Broadway ticket buyers were white, and most had an income of over $75,000 per year. By putting shows online, you run the risk that those would could and have been paying for Broadway tickets for years, simply choose the easier and cheaper option of paying $8.99 per month, causing theatres to lose income and footfall. 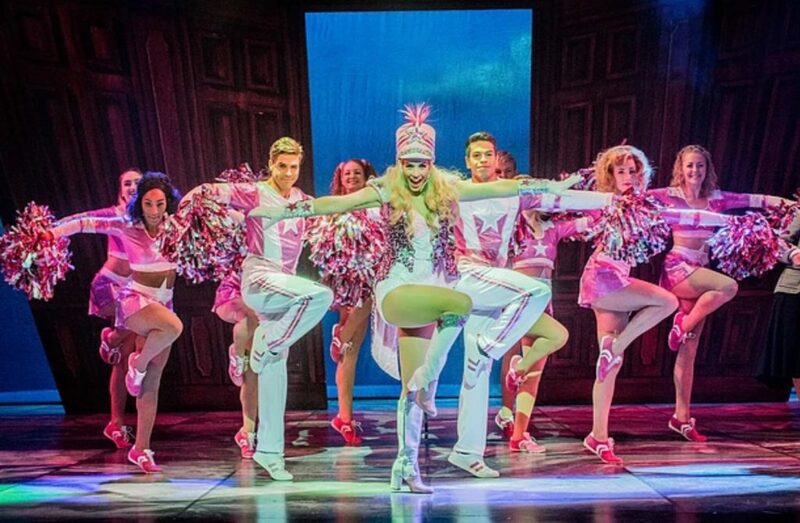 He uses Legally Blonde as an example whereby the musical was filmed and aired in 2007, causing ticket sales in New York to “pop”, as well as also benefiting the touring production. Further financial aid to box offices from live streaming shows comes from the fact that “the majority of shows [on Broadway] never turn a profit”. This article explains that much of Broadway’s success comes from a handful of big hits, such as Wicked and The Lion King, which continue to attract tourists, and many smaller shows actually struggle to fill seats or aren’t reaching their full potential. Therefore, streaming could help fill those gaps by helping to promote shows while they are stull running or offering producers a new revenue stream long after the production has closed. Chris Mellor from The Guardianagrees, based on the evidence of a project conducted for the 2011 Camden Fringe Festival. At the festival, 18 performances were streamed and each performance pulled in an average 500 viewers, extending to shows which may often have smaller audiences such as dance and plays. you won’t find Hamilton or Book of Mormon or any currently running hot ticket. She Loves Me, for instance, ran only for 20 weeks in 2016, and BroadwayHD live-streamed the show after it had nearly concluded its run. By that point, there was little to lose in terms of ticket sales. As with bringing theatre to the big screen, industry producers are still wary of this development. Many will continue to argue that it runs more financial risks than produces financial gain, and that theatre cannot be properly understood and engaged with on a screen – especially a small laptop or smartphone screen – when it was made for the stage. In 2018, Netflix brought Bruce Springsteen’s show from Broadway to its multi-million-dollar platform. Thom Zimny was the directed and producer of Springsteen on Broadway and said himself “Having seen the show from the first rehearsals, I knew as a film-maker that no shot or cutaway could ever equal the power of seeing Bruce on stage just playing and talking”. Audiences can be equally difficult to convince about filmed theatre, with complaints often arising about the musical numbers performed at the Tony Awards – that performances don’t come across as great as they usually do in live theatre. However, putting your show online is not the first and last step of this process. “Producers need to learn how to engage better with audiences online to get the full benefits of the medium”, says Chris Mellor. “The combination of live streaming and digital engagement could generate valuable audience data they couldn’t otherwise access”. Chris Mellor details the recent production of The Untimely Death of Mr Strangeat Camden People’s Theatre, where the show not only had a dedicated website for the main character, but also a blog for the creative team to log the artistic journey, a secret reading club and much more online for audiences to engage with long before the show was produced. Whether audiences, producers and industries like the idea of having theatre on demand, the fact of the matter is that it is inevitable. Streaming media has already disrupted music with platforms such as Spotify and YouTube dominating the once beloved HMV, and Netflix, Amazon Prime Now TV and Sky Go doing the same to movies and television industries. It should therefore come as no surprise that the same thing is happening in our theatres. There is also the argument that whether it is professionally done or not, theatre on demand is already accessible in the form of bootlegs. With everyone today armed with a smartphone and internet connection, every theatregoer is a potential bootlegger. You want to see a full-length version of Legally Blonde? Go to YouTube. You want to see Hamilton shot by someone’s navel with their iPhone? You’re going to get poor quality and lousy sound, but it’s out there. The idea is not, however, “if you can’t beat them, join them” but there is an element of that in there. Live theatre is inevitable and if producers can create good-quality versions and still make profit from them, rather than having poor quality productions of their shows circling the internet, surely this is a step they’d be willing to take? Live-streaming theatre is still in its infancy and there are definitely ways for it to be used to advantage theatre in general, but it may be a while before it heavily takes hold.